Auxins are plant hormones. The most important auxin produced by plants is indole-3-acetic acid (IAA). Link to illustrated description of seed development. The formation of new leaves in the apical meristem [View] is initiated by the accumulation of auxin. Already-developing leaves deplete the surrounding cells of auxin so that the new leaves do not form too close to them. In this way, the characteristic pattern of leaves in the plant is established. Auxin also controls the precise patterning of the epidermal cells of the developing leaf. Plant shoots display positive phototropism: when illuminated from one direction, the shoot proceeds to grow in that direction. It is absorbed by a flavoprotein called phototropin. Flavoproteins contain flavin as a prosthetic group. Link to some of the experiments that led to these conclusions. Gravitropism is a plant growth response to gravity. Roots display positive gravitropism: they grow down. Statoliths (organelles containing starch grains) settle by gravity to the bottom of cells in the root tip. This causes PIN proteins to redistribute to the underside of the cell where they pump auxin out of the cell; that is, they are efflux transporters. The auxin then accumulates along the under side of the root. So the cells at the top surface of the root elongate, causing the root to grow down. Growth of the shoot apex (terminal shoot) usually inhibits the development of the lateral buds on the stem beneath. This phenomenon is called apical dominance. If the terminal shoot of a plant is removed, the inhibition is lifted, and lateral buds begin growth. Gardeners exploit this principle by pruning the terminal shoot of ornamental shrubs, etc. The release of apical dominance enables lateral branches to develop and the plant becomes bushier. The process usually must be repeated because one or two laterals will eventually outstrip the others and reimpose apical dominance. Apical dominance seems to result from the downward transport of auxin produced in the apical meristem. In fact, if the apical meristem is removed and IAA applied to the stump, inhibition of the lateral buds is maintained. The common white potato is really a portion of the underground stem of the potato plant. It has a terminal bud or "eye" and several lateral buds. After a long period of storage, the terminal bud usually sprouts but the other buds do not. 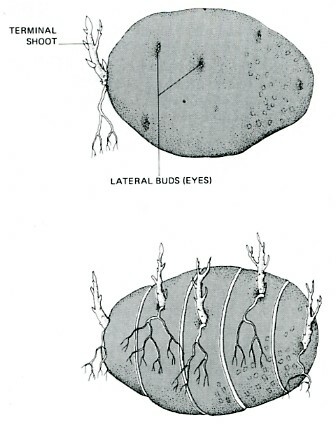 However, if the potato is sliced into sections, one bud to a section, the lateral buds develop just as quickly as the terminal bud. Pollination of the flowers of angiosperms initiates the formation of seeds. As the seeds mature, they release auxin to the surrounding flower parts, which develop into the fruit that covers the seeds. Some commercial growers deliberately initiate fruit development by applying auxin to the flowers. Not only does this ensure that all the flowers will "set" fruit, but it also maximizes the likelihood that all the fruits will be ready for harvest at the same time. Auxin also plays a role in the abscission of leaves and fruits. Young leaves and fruits produce auxin and so long as they do so, they remain attached to the stem. 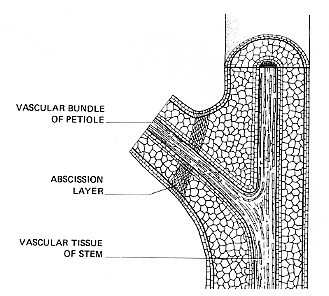 When the level of auxin declines, a special layer of cells — the abscission layer — forms at the base of the petiole or fruit stalk. Soon the petiole or fruit stalk breaks free at this point and the leaf or fruit falls to the ground. The figure on the right shows a nice demonstration of the role of auxin in abscission. If the blade of a leaf is removed, the petiole remains attached to the stem for only a few more days (right). 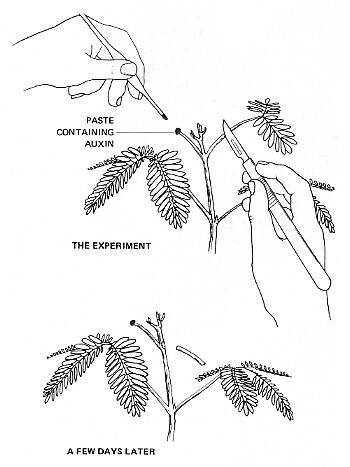 If, however, auxin is applied to the cut end of the petiole, abscission of the petiole is greatly delayed (left). Fruit growers often apply auxin sprays to cut down the loss of fruit from premature dropping. The localized accumulation of auxin in epidermal cells of the root initiates the formation of lateral or secondary roots. If soil moisture is unevenly distributed around the root, auxin preferentially stimulates the development of lateral roots on the moist side. Auxin also stimulates the formation of adventitious roots in many species. Adventitious roots grow from stems or leaves rather than from the regular root system of the plant. Horticulturists may propagate desirable plants by cutting pieces of stem and placing them base down in moist soil. Eventually adventitious roots grow out at the base of the cutting. The process can often be hastened by treating the cuttings with a solution or powder containing a synthetic auxin. Auxin moves through the plant by two mechanisms. It passes in the sap moving through the phloem from where it is synthesized (its "source", usually the shoot) to a "sink" (e.g., the root). It also passes from cell to cell by the following mechanism. at the lateral surface of the cell where they move auxin laterally (e.g., to mediate phototropism and gravitropism). Identifying the signals that direct the appropriate placement of the PIN proteins is an active area of research. How does auxin achieve its many different effects in the plant? reduction in the redistribution of PIN proteins. Some of the direct effects of auxin may be mediated by its binding to a cell-surface receptor designated ABP1 ("Auxin-binding protein 1"). proteins responsible for attaching ubiquitin to one or another of several Aux/IAA proteins. This triggers the destruction of the Aux/IAA proteins by proteasomes. promoters and other control sequences of genes that are turned on (or off) by auxin. For example, the gibberellins, another group of plant hormones, exert their effects using a similar strategy. Link to a description. provides a logical basis for mediating the different auxin effects that I have described. But how this is done remains to be discovered. Some of the most widely-used weed killers are synthetic auxins. These include 2,4-dichlorophenoxy acetic acid (2,4-D) and 2,4,5-trichlorophenoxy acetic acid (2,4,5-T). As the formulas show, 2,4,5-T is 2,4-D with a third chlorine atom, instead of a hydrogen atom, at the #5 position in the benzene ring (blue circles). 2,4-D and its many variants are popular because they are selective herbicides, killing broad-leaved plants but not grasses (no one knows the basis of this selectivity). Why should a synthetic auxin kill the plant? It turns out that the auxin influx transporter works fine for 2,4-D, but that 2,4-D cannot leave the cell through the efflux transporters. Perhaps it is the resulting accumulation of 2,4-D within the cell that kills it. A mixture of 2,4,-D and 2,4,5-T was the "agent orange" used by the U.S. military to defoliate the forest in parts of South Vietnam. Because of health concerns, 2,4,5-T is no longer used in the U.S.